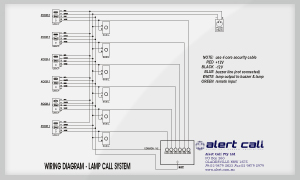 The CallALERT Lamp System is designed as a low cost Nurse Call System for small installations. It is a system consisting of Lamp Call Points connecting to Overdoor Lights and lamp style LED Annunciator Panels. This system features very long life and simple maintenance. The lamp call points can also be used as a direct replacement for many existing nurse call systems. The points are available in many different versions such as latching, non-latching, 12 and 24 volt. The Lamp call system is ideal for small installation such as clinics.